Who: Saul Schwartz (author) and his newlywed wife, Fern Bradshaw of Alexandria, Virginia. We chose April in Paris for our honeymoon; this was our first trip to the French capital. The day after our wedding at Lansdowne in Leesburg, Virginia, we flew nonstop from Dulles Airport to Charles De Gaulle Airport. 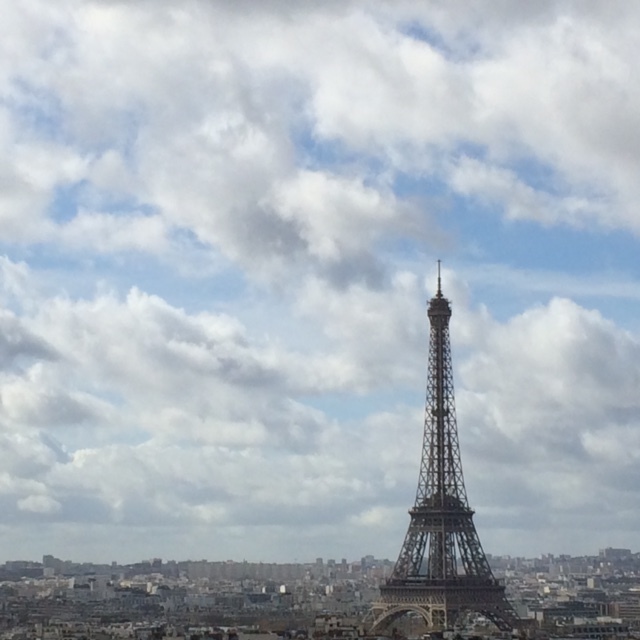 We spent one week in Paris traveling within many of the twenty arrondissements (districts). 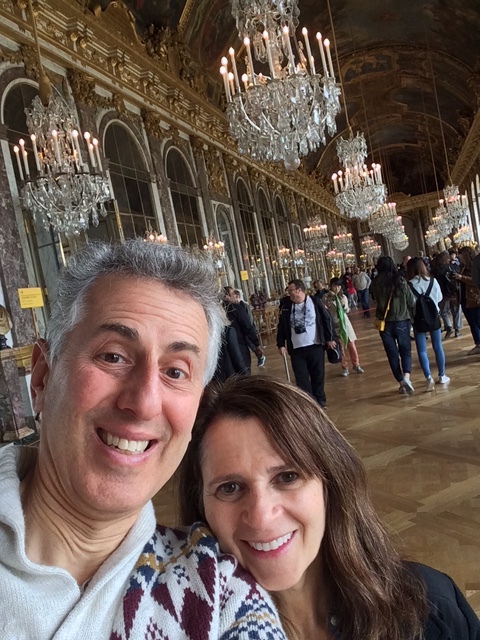 Fern and I quickly learned to navigate the sixteen numbered lines of the busy but extensive metro, along with the commuter rail lines, enabling us to tour many world class art museums, beautiful architectural wonders; as well as religious, historic and cultural sites. We purchased the Paris Pass in advance, which included unlimited travel within central Paris on the metro or train, along with entry for most attractions (but not the Eiffel Tower). High points: A romantic three course dinner at 58 Tour Eiffel, located at the first level of the 986 feet Eiffel Tower proved to be our culinary highlight, as we enjoyed a panoramic view of Paris transforming from day to night as we celebrated Fern’s birthday. 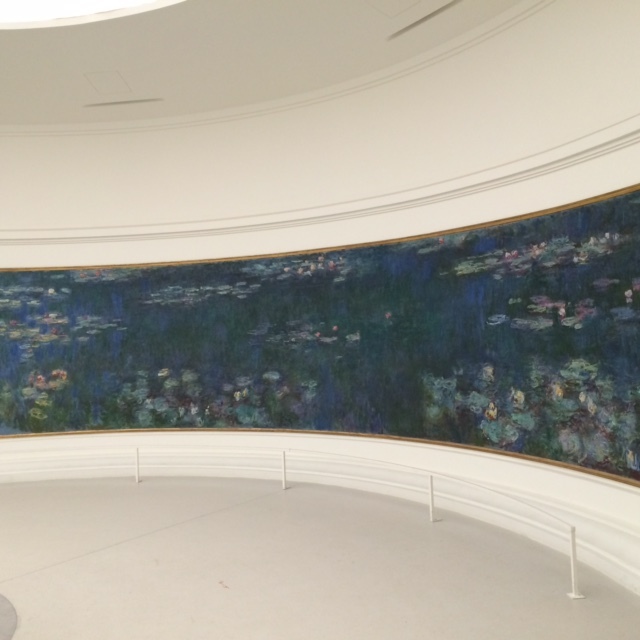 On the banks of the Seine in a corner of the Tuileries Gardens, we discovered our favorite art museum, Musee de l’Orangerie, which displays eight spectacular water lily murals by Monet in two oval rooms, along with works of the major impressionists. Climbing the 387 steps to the top of tower of the French gothic Notre Dame Cathedral rewarded us with close-up views of its stone gargoyles on the ledge, 13th century church bells, dramatic stained glassed windows, but no hunchback. 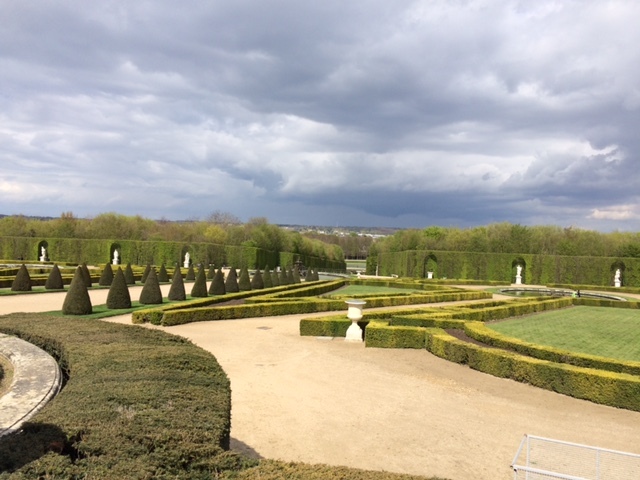 We spent a full day exploring the vast grounds and grandeur of the Palace of Versailles, strolling through some of the 250 acres of manicured gardens with fountains and statues and Marie Antoinette’s separate chateau – the Petit Trianon – many acres away from the castle and the king (Louis XVI). Cultural connection to Washington, D.C.: L’Enfant’s design of Washington, D.C., with circles, grand avenues, monumental architecture and public gardens parallels the layout of central Paris. The Arc de Triomphe, engraved with names of military leaders, is a dramatic tribute to French soldiers lost in wars, standing in the center of Charles de Gaulle plaza. From the viewing deck of the triumphal arch, after climbing 234 more steps, we observed a series of twelve wide avenues radiating out. Similar to the layout of the Washington Mall from the Capitol to the Washington Monument and then to the Lincoln memorial, the Arc di Triomphe is on a historic axis through a sequence of monuments and grand boulevards to the courtyard of the Louvre museum and a smaller arch. 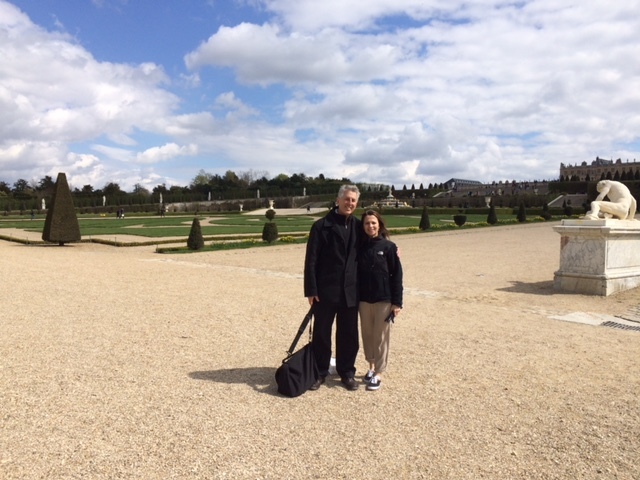 Like Parisians we strolled through the grand central alley of the Tuileries Gardens, lined with statutes, fountains and varied plants and trees, from the Louvre museum to the massive Concord plaza. This outing reminded us of walks along the Washington Mall. Biggest revelation: We did not find the French to be overly warm or inviting when we sought information such as directions from the hotel staff or restaurant suggestions. An exception took place during our dinner at an informal Italian restaurant near the Eiffel Tower, Firmine. After we showed the restaurant staff an article where the restaurant had been mentioned (that they had never seen before) they treated us royally, but – no free dessert or appetizer was offered even when we returned for a second meal the next day. Our 21st century reality: In 2016, first hand observation of police presence in Paris was to be expected given recent world events. However, we did not expect that our on our way from Charles de Gaulle airport to the hotel our Paris shuttle driver would be pulled over by police for making an illegal turn and then he was interrogated. During our visit to the Jewish Museum of Art and History in Marais the Jewish quarter, heavily armed camouflaged police patrolled outside the entrance. Although the museum is located in a beautiful mansion, the collection is simplistic and lacked focus on modern day life for Jews in Paris. Throughout the trip we heard French police sirens. When we left Paris, we had to be rerouted from Paris to Zurich to Frankfort to Dulles because of the delayed security check of every passenger on a flight from Paris to Brussels. As a result, we were in four countries on one very long day of return! We unexpectedly enjoyed Swiss chocolate and a Bavarian pretzel. Fondest memory: On a Sunday morning, we wandered through Montmarte, a bohemian neighborhood, home to artists throughout the centuries and the Moulin Rouge cabaret. We ascended the largest hill in Paris, walking by peddlers selling Eiffel Tower models or trying to engage tourists in find the ball gambling games. At the top we briefly attended the service within the majestic white domed Basilica of the Sacre-Coeur. As we began to descend the steps, a harpist began to play the Canon in D, which was the song Fern and I had walked down the aisle to in our wedding exactly one week earlier.